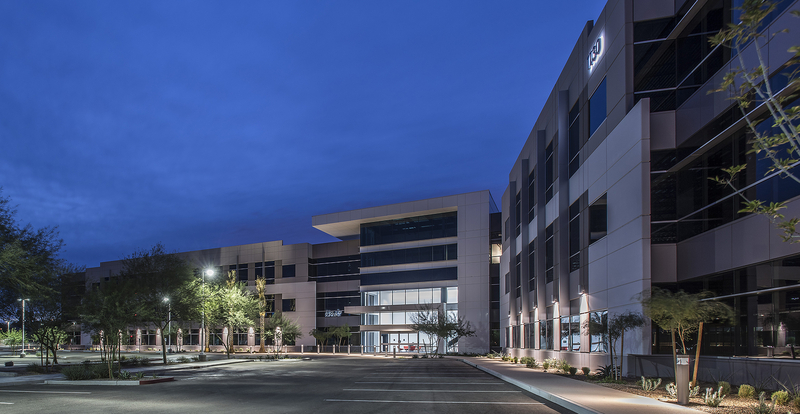 MESA, Arizona, May 31, 2018 – Engineering consulting firm EPS Group, Inc. has completed a long-term lease that will relocate and expand the company’s main office into the newest building at Waypoint, a Harvard Investments and Lincoln Property Company (LPC) development totaling four buildings and almost one-half-million square feet of Class A office space in the Riverview mixed-use district in Mesa, Arizona. With the lease, EPS will move from its current location near Baseline Road and Arizona Avenue in Mesa into 27,283 square feet at Waypoint Four, a 152,000-square-foot, Class A office building at 1130 N. Alma School Rd. and the latest addition to the Waypoint campus. Founded in 2003, EPS Group is a full-service consulting firm offering land development, design and infrastructure solutions to public and private clients. Its relocation to Waypoint will allow the company to expand its main office, one of four EPS offices that also include locations in Avondale, Tucson and Flagstaff, Arizona. “Waypoint became the primary focus of our office search because it afforded us a quality professional office space, with the square footage we required, and great freeway access without the traffic congestion of other Mesa/Tempe border office suites,” said EPS Group President Elijah Williams. EPS will relocate to Waypoint in November. The company was represented in its lease negotiations by Ryan Orton and Rod Beach at Cresa. Harvard and LPC were represented by Dave Carder and Scott Boardman at Cushman and Wakefield, the exclusive leasing brokers for Waypoint. Waypoint Buildings One, Two and Three are fully leased to tenants including American Traffic Solutions, Ashton Woods, Mitel Corporation, Udall Shumway PLC and the corporate headquarters for Nextcare. Built in 2016, Waypoint Four is now 50 percent leased to EPS and a leading Fortune 200 company. Fronting the Loop 202 freeway at the borders of Mesa, Tempe and Scottsdale, Waypoint totals 425,861 square feet in four buildings designed to accommodate single- and multiple-occupancy users. Buildings at Waypoint feature a high-tech modern aesthetic with multi-story lobbies and creative workspaces. Buildings Three and Four, in particular, offer 14-foot open ceilings and glass windows that begin at floor level and extend 10 feet high. The 35-acre Waypoint project sits adjacent to Riverview, which offers 1.3 million square feet of retail, restaurants, entertainment and the upscale Sheraton and Hyatt Place hotels. Also within Riverview are Riverview Lake and Sloan Park, home of the Chicago Cubs spring training facility. Waypoint is located just six miles east of Phoenix Sky Harbor International Airport and is minutes from Arizona State University. It provides convenient access to Loop 101 at Rio Salado Parkway, and the Loop 202 at Dobson and Alma School roads. LPC manages all four buildings at Waypoint, part of the firm’s approximately 6.5 million-square-foot Phoenix property management portfolio. For more on Waypoint, visit the property website at www.waypointarizona.com. To discuss leasing, investment or property management opportunities with Lincoln Property Company in the Desert West region, please call David Krumwiede or John Orsak at (602) 912-8888. Harvard Investments, Inc. is a real estate investment and development company with real estate holdings throughout the western United States. Harvard combines experience, integrity, and financial stability to create high quality, environmentally sensitive, profitable communities. Harvard’s Canadian parent, the Hill Companies, is a privately held diversified company involved in real estate development including construction and leasing of commercial office buildings and retail properties, oil and gas production and distribution, broadcasting, surety bonding, and insurance. This year, the Hill Companies celebrates its 115th year of continuous family ownership and operation. To learn more visit http://www.harvardinvestments.com/. Lincoln Property Company (LPC) is an international full service real estate firm offering real estate investment, development, design/construction management, leasing and property management/ receivership/asset management services. LPC has approximately 7,300 employees and maintains a presence in more than 200 U.S. cities and 12 countries throughout Europe. Since 1965, LPC has developed more than 132 million square feet of office, industrial and retail projects known for their design, quality and superior locations. It currently manages more than 236 million square feet of commercial space. Lincoln is also one of the nation’s largest apartment developers, having developed more than 212,000 multifamily units and currently managing more than 165,000 multifamily units. LPC’s Desert West Region, which includes Arizona, Nevada, Utah and New Mexico, is based in Phoenix and has been operating since 2001. In that time, the regional office has developed more than 3 million square feet, acquired 4 million square feet and manages approximately 6.5 million square feet of commercial space, including major, award-winning and LEED Certified developments and investments. In 2016, the Phoenix office generated a record-breaking year with more than $233 million in investment and development activity. It is consistently ranked among Phoenix’s top commercial real estate firms for both development and property management, and was most recently recognized as an Arizona Republic Top Companies to Work for in Arizona. To learn more about Lincoln Property Company, please visit www.lpc.com or www.lpcphx.com.